Rising longevity and low interest rates are stirring up a perfect storm for investors – but a few smart decisions could generate a sustainable income for an extra 10 years or more in later life. One smart move open to investors is to choose an investment vehicle whose costs will eat up less of their income. According to data from Numis Securities, the average UK wealth manager charges 1.8% a year. The lower fees offered by some challenger brands could considerably extend the life of a pension pot. 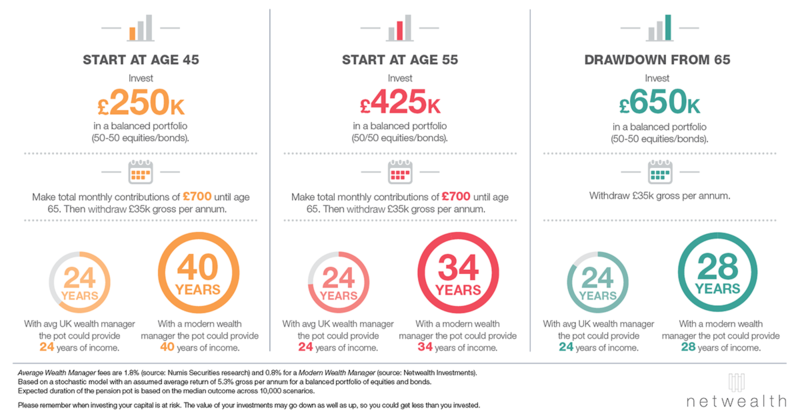 Research developed by Netwealth shows that an investor aged 65 with a portfolio valued at £650,000 who chose to draw down £35,000 a year should expect to see their money last 24 years. But by selecting a more modern wealth management service, with fees around 0.8% per annum, the investor would be able to make their money last 28 years. Investors who start earlier could achieve an even longer retirement in comfort. For instance, a saver who invests a £250,000 pot at age 45, goes on to contribute a total of £700 gross a month until age 65 and then retires with an income of £35,000 a year, should see the money last 24 years with a traditional wealth manager. Using a cost-effective investment manager, however, they should secure their income for 40 years or 16 years more, a substantial difference. For an inexperienced investor, the difference in charges might appear to be a small number. However, it&apos;s quite an eye-opener when people realise it could offer them an extra 10 years or more of comfortable retirement. Challenger investment services such as Netwealth are able to hold down costs by using a combination of qualified advisers and investment managers with online technology. Netwealth dispenses the extraneous stuff – wood-panelled rooms, salespeople and golf days – which do so much to drive up traditional costs. The effect of low charges could be even more powerful if used in combination with other strategies for sustainable saving. For instance, an investor could choose to draw down a little less income every year, or to adjust drawdown regularly to reflect the changing value of the pension pot. Netwealth also recommends investors to ask their wealth manager the full details on fees – not just the headline – as well as understanding where their money is being invested. This includes looking at how diversified your investments are and ensuring the level of risk is appropriate to your financial goals. Average Wealth Manager fees are 1.8% (source: Numis Securities research) and 0.8% for a Modern Wealth Manager (source: Netwealth Investments). Based on a stochastic model with an assumed average return of 5.3% gross per annum for a balanced portfolio of equities and bonds. Expected duration of the pension pot is based on the median outcome across 10,000 scenarios.